Water4Life makes use of the so called gravity purifier with ceramic filter candles, the heart of the system. Water4Life cooperates with two different manufacturers of filter candles. Both have the filtration of bacteria from the water at a level of more then 99% in common. Both models consist of porous ceramics with silver impregnation. This combination assures a high reliability of the filtration of bacteria. One type of candles also contains granular activated carbon which can absorb some chemical and mineral contaminants, by which some improvement of taste can be achieved. This however is of secondary interest. The gravity water purifier is a relatively commonly available product in development countries, but is also sold elsewhere. The system consists of two reservoirs on top of each other. The top reservoir contains two filter candles, of which the water exit is located above the lower reservoir. The top reservoir is filled with contaminated source water. Gravity pushes the water gradually through the porous filter candle, after which the safe drinking water collects at the lower reservoir. The average flow rate of the water is limited to about 1 to 3 litres per hour. From surveys it appeared that users do not clean or clean a wrong manner the reservoir in which the clean water is collected. Consequently bacteria can again grow and multiply in the clean water and as such recontaminate the water. 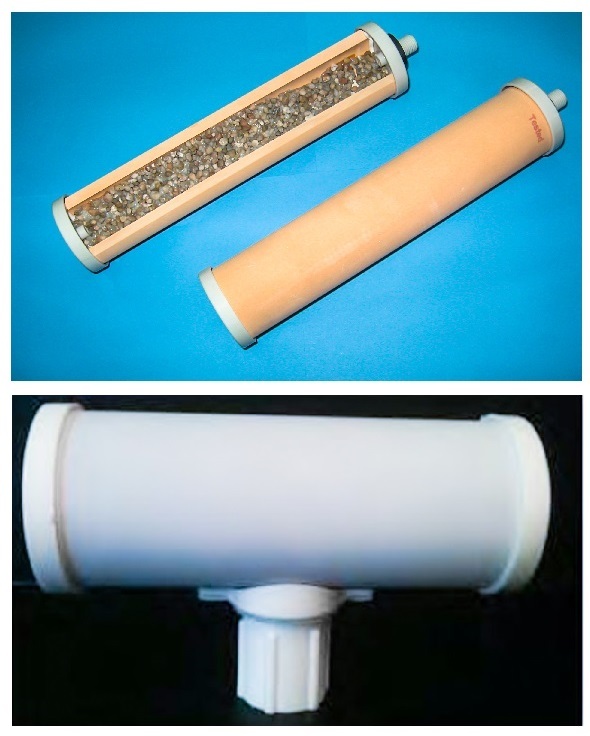 Ceramic water filters have been identified as one of the most promising and accessible technologies for treating water at the household level. In a six-month trial, water filters were distributed randomly to half of the 50 participating households in a rural community in Bolivia; the remaining households continued to use customary water handling practices and served as controls. In four rounds of sampling following distribution of the filters, 100% of the 96 water samples from the filter households were free of thermotolerant coliforms compared with 15.5% of the control household samples. Diarrheal disease risk for individuals in intervention households was 70% lower than for controls (95% confidence interval [CI]53−80%; P < 0.001). For children less than five years old, the reduction in risk was 83% (95% [CI] = 51−94%; P < 0.001). These results show that affordable ceramic water filters enable low-income households to treat and maintain the microbiologic quality of their drinking water.